When beginning this module and having been fortunate enough to come across Maud’s wonderful autobiography, I always wanted to be able to find evidence of her family tree to understand more about her family that she speaks so lovingly of in the pages of her memoir. Yet this proved harder than I had predicted. Whereas Maud speaks about her parents, siblings and husband, she never states any names or dates, which made the search ten times harder than I would have liked. After scouring various ancestry websites, often with no luck, I came across a small family tree created by someone, that I thought could potentially be Maud! I was so excited, and immediately messaged the creator of the tree to see if he could give me any more information. He was eager to help and I am pleased to say that after days of searching, he has been able to track her down, which I am incredibly grateful for! Therefore, after his research I am finally able to piece together the life of the woman I have grown to admire after this module, which has come at the conclusion of the Writing Lives course. The information that was found is from the 1911 and the 1901 census, and does not include two of Maud’s siblings, as they had either left the household at the time of the census’ or had not been born yet. However, from the information, we can conclude that Maud’s Father Samuel Mills (Mills being her maiden name) was born in Tipton in the year 1852. In the census, his trade is given as a plumber and a publican. He was married to Maria Mills, born in 1857 in the nearby town of West Bromwich. The two were married for 26 years, lived in Tipton for most of their lives and produced seven children, one of which died at eight months old. Her siblings include Clara, (b. 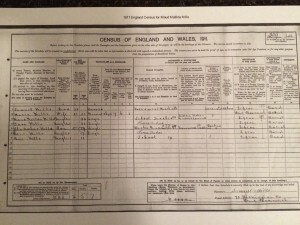 1889) who was registered as being on home duties at the time of the census, John Arthur (b. 1891), working as an iron and metal merchant, possibly at the influence of his Father. Dora (b. 1893) who, like her sister Clara was also registered as being on home duties and Elsie Mills, (b. 1900) the youngest of the siblings at the time of the census at age 11. Maud herself was registered as a schoolteacher, presumably at the beginning of her career. We also managed to find evidence of her marriage to her husband, someone who she talks so highly about and was married to for a healthy 52 years. She states that she left teaching to start a family, and I believe that records support that. She was married to Nehemiah Clarke in 1919, registered in West Bromwich, and he died in 1965 in Wednesbury, supporting the minimal timeline we have of her life. She also gave birth to two children, Janet Clarke in 1915 and Phyllis Clarke in 1920, who I believe to have been a head teacher at a school in the Aston area of Birmingham. Sadly, records support Maud’s memoir when she writes about the terrible death of her eldest daughter Janet, from unknown causes in 1921, at the young age of six. This was registered in Kings Norton, Birmingham. This has been a massive breakthrough for me, and has really cemented my research into Maud and her life and has made me incredibly proud of the work I have achieved on the module. Throughout the various blog posts, I have exposed all parts of Maud’s childhood, and I hope that I have done so in a respectful and memorable way and that people continue to read about the woman that I feel I have shared a bond with over the months. It has been incredible for me to feel such warmth for someone who I only know by reading her autobiography, but I would like to thank Maud for writing it and doing so in such a wonderful and literary way, and I am sure she was very content with the results.